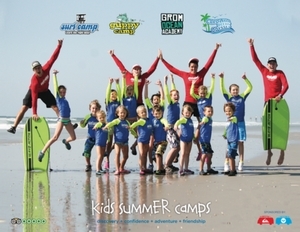 We are stoked to release our new 2017 Kids Summer Camp Digital Catalog. We know that a child’s first experience with the ocean will shape their attitude towards it for the rest of their life. With both day and overnight options, our goal is for kids to develop a love and respect for the ocean, gain confidence and develop character, one step at a time all while having the best summer ever! Have any questions? Give me a shout at rick@wbsurfcamp.com or 910.256.7873.